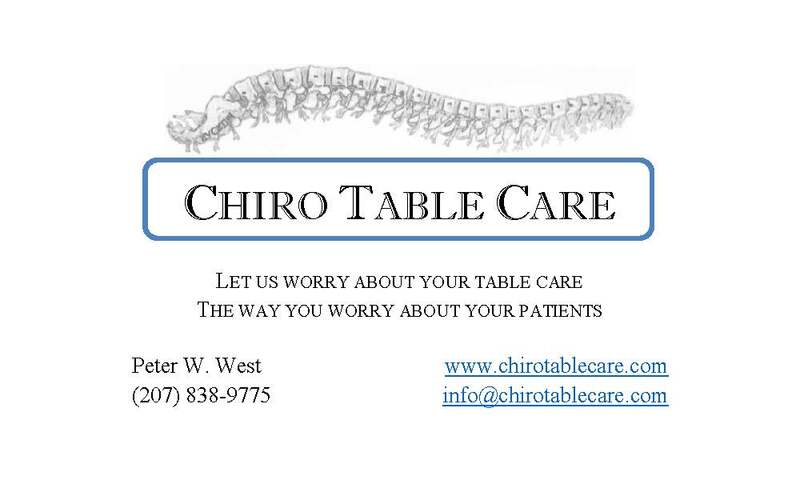 Chiro Table Care is your premier table repair and maintenance service provider in the New England area. Chiro Table Care is the only company in northern New England exclusively devoted to care and maintenance of your chiropractic treatment tables. Chiro Table Care officially formed in 2018 to fill an observed need in Maine and the surrounding area. Our philosophy is this: You, as a health practitioner, have one priority; the well-being of your patients. Our priority is the well-being of your tables. As you know, a chiropractic table is a collection of components and disciplines brought together to assist with an intended task, i.e. the Chiropractic Adjustment. Because of the punishment a table receives over weeks, months, and years of use, their parts loosen and wear. Periodic inspections and proper maintenance can keep a table care free throughout its lifetime. But sometimes things break. Our aim is to get your table restored on your timeframe, expediting processes when necessary. Chiro Table Care is fully insured and wholly owned by Trinity Collaborations, LLC.